Spiritual Spectra offers Medium Readings to allow individuals to communicate with loved ones in Spirit, Spirit Guides and Angels in a safe and compassionate environment. Having given over 200 readings, we are able to make the connection you need. 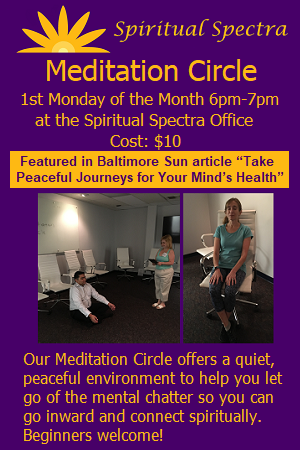 Medium Readings are offered in our Maryland office as well as over the phone or online. Please visit our Frequently Asked Questions page prior to scheduling your appointment for answers to method of payment, and more. Contact us to schedule a reading. Please indicate if the appointment will be at our office, via phone or online. Choose the Medium Reading that is right for you. Clients can choose to pay in advance by clicking the above link or on the day of the appointment. Please visit our Frequently Asked Questions page prior to scheduling your appointment for answers to method of payment, and more. Contact us to schedule your reading. Please indicate if the appointment will be at our office, via phone or online. Medium Readings can also be offered for groups and events, click here for more information and pricing; and at Metaphysical/New Age fairs/Psychic and festivals. Click here for our Calendar listing of Medium Readings opportunities and events. Times and cost at fairs and festivals may vary. We also offer Messages from Spirit which is a Group Psychic-Medium Reading Event which offers a warm, inviting, community environment whereupon each person receives the benefit of communing with Spirit by hearing and/or receiving messages. Being centrally located, our Medium Readings serve the following communities: Columbia, Ellicott City, Elkridge, Catonsville, Jessup, Fort Meade, Laurel, Fulton, Silver Spring, Clarksville, Highland and Olney, Maryland. However, we offer readings over the phone and online so we can serve you no matter where you live. Contact us to schedule an appointment today!